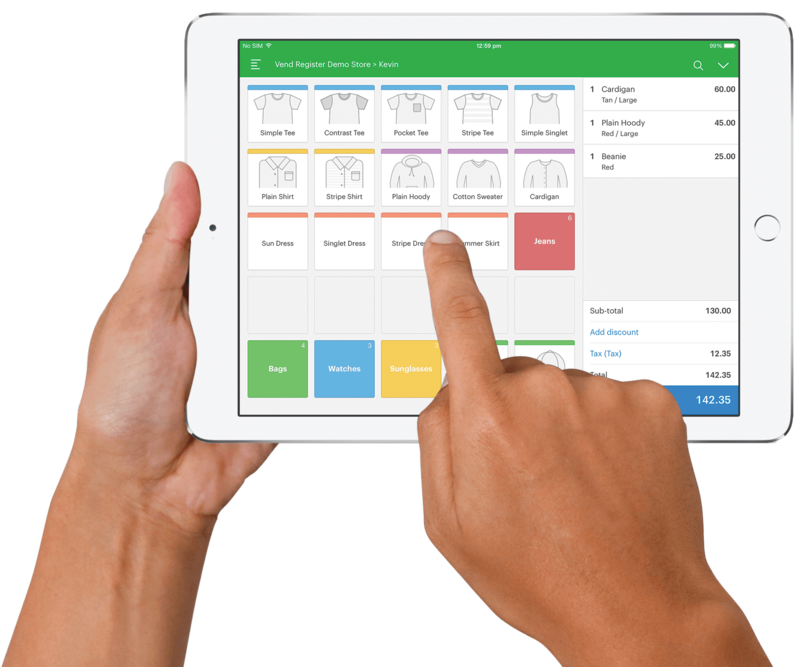 Run the world’s best retail with Vend’s iPad POS system. 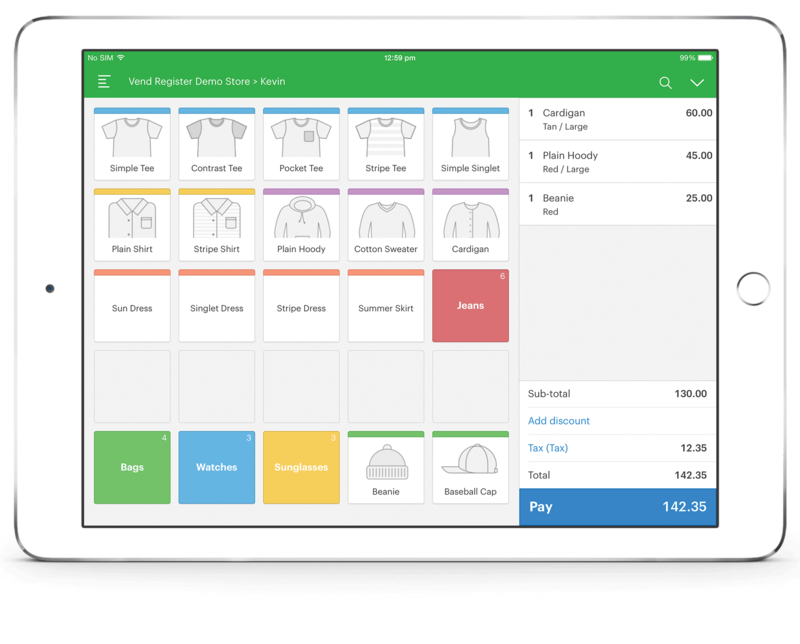 Unleash the power of mobile retail with Vend iPad POS software. Whether you have one store or one hundred, Vend point of sale has everything you need to easily manage your retail business. A complete point of sale solution, ready to trade in just 5 minutes. Get out from behind the counter and sell on the go with iPad POS on the shop floor, at tradeshows, or at a pop-up event. 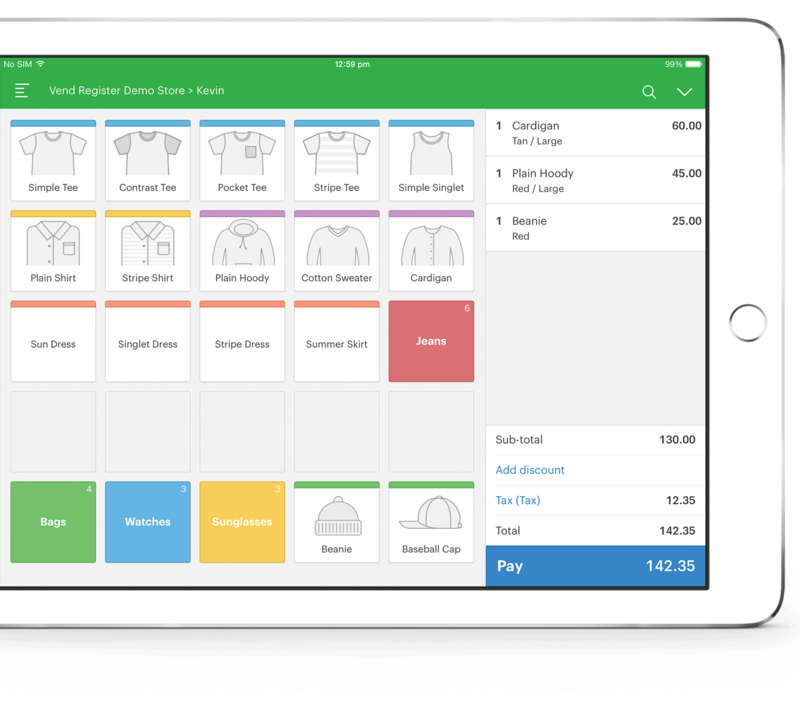 Simple to use and optimized for the iPad experience, you can train your staff with Vend in a matter of minutes. Accept payments fast and delight your customers. Quickly accept payments in any location, with a range of mobile payment options from leading merchant providers around the world. With iPad POS, you can help customers find what they need on the shop floor instead of being tied to a cash register. Easily manage and grow your business from any location. Manage your products, prices and customer data anywhere in the world with Vend. Track employee performance, discover your best selling products, and get a snapshot of how your stores are performing with Vend Reporting. All the hardware you need to run your business on an iPad. 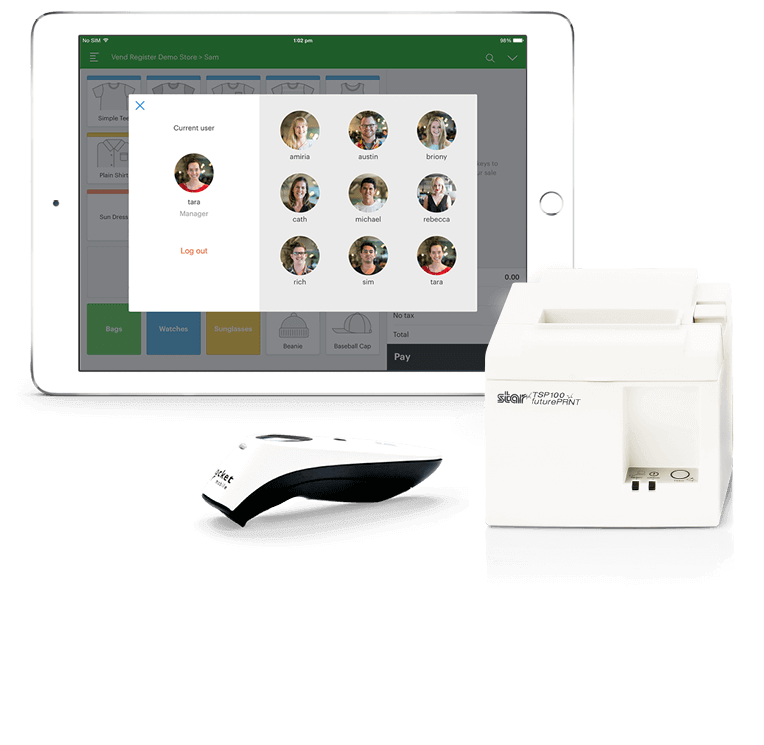 You don’t need to be an IT genius to set up a beautiful iPad POS system with Vend. We’ve got plenty of helpful guides, walk-throughs and videos to get you up and running. Vend iPad POS works with a wide range of hardware. Simply plug in a network receipt printer, connect a barcode scanner, and you’re set. It might even work with printers, cash drawers & barcode scanners you already own. Don’t have gear yet? Check out our recommended models and bundle packages. Start your free 14 day trial and get your store set up following the easy online guides. When you’re ready to start selling, download the Vend Register app on your iPad and take your store wherever you go. Vend is free to try for 14 days - perfect for small stores, pop-up stores and startups wanting to test if Vend is right for their business. We also have a range of clear, affordable pricing plans all for a low monthly fee. There’s no obligation, no minimum term commitment and no hidden fees. 20,000+ retailers use Vend iPad POS to run the world’s best retail. Why retailers worldwide love Vend. Vend’s iPad POS solution comes with the features you need to grow your business, save time and reduce costs. 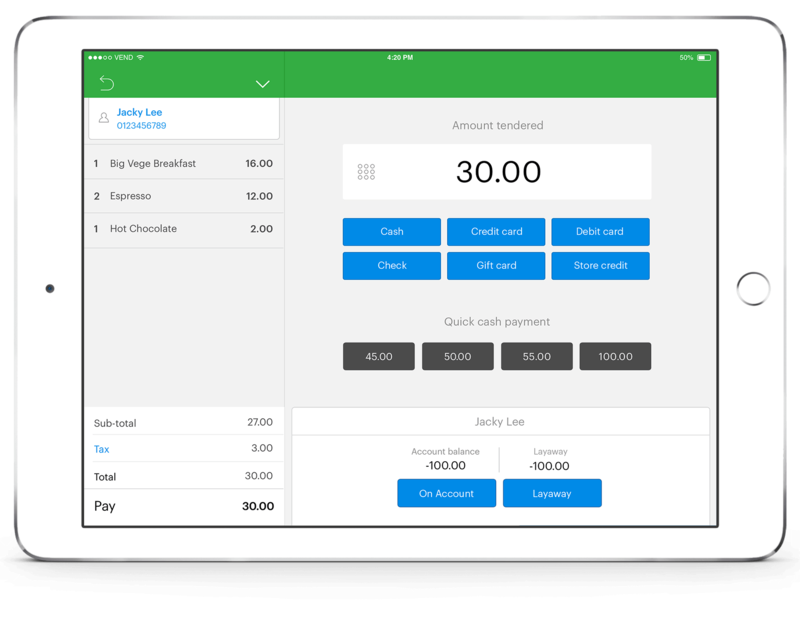 Vend makes it easy to sell to your customers, whether you use our Vend Register iPad app, or our responsive web-based POS on Mac or PC. Take control of your inventory with full or partial inventory counts, and easily balance and transfer your inventory between your different locations. Choose the best way to accept payments, including credit, debit and gift cards. Vend works with leading merchant providers around the world. Get an instant snapshot of your sales, inventory, payments, and more for smarter retail decision-making from any location. Easily grow your customer list with Vend. View purchase history and account balances, create customer groups, and centrally manage all your customers. With offices in USA, Canada, Australia, UK & New Zealand, our friendly support team is happy to help at any time and on every channel. 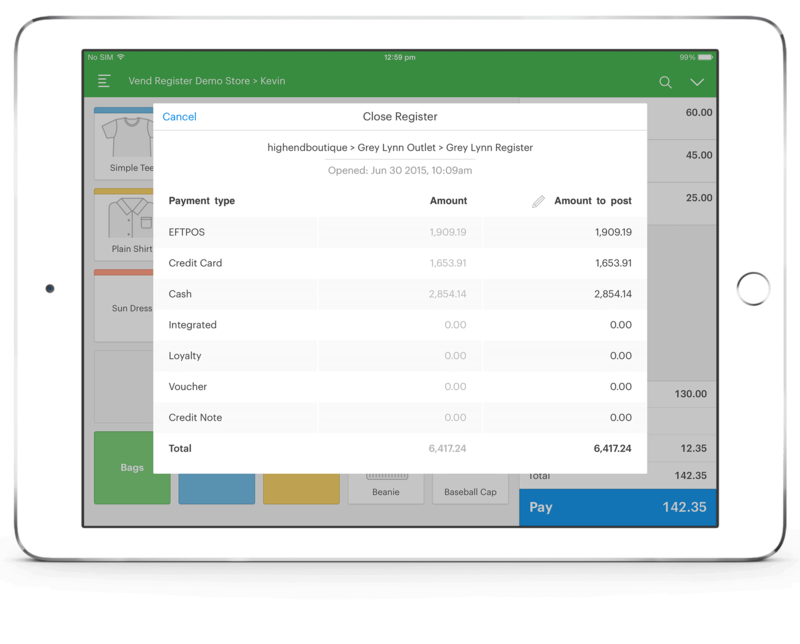 Get honest answers to your top questions about switching to Vend’s iPad POS software. I want to use Vend on an iPad, is it going to work for me? First off, good for you for deciding to use an iPad POS solution. An increasing number of retailers are opting for mobile POS systems because they’re sleek, portable, and allow you to bring the checkout process to your customers. And yes, Vend runs great on an iPad. You’ll be able to get the system up and running either by downloading our iPad app or using our web-based application. Check out this article for step-by-step instructions and a video on how to set up Vend on your iPad. I don’t want to spend a fortune, how much is Vend going to cost? We don’t want you to spend a fortune either which is why Vend has a tiered pricing model where the cost depends on how you'll be using Vend. All plans include one free register, but you can add as many registers as you need. To be safe, you should probably start with a free account so you can give us a test drive without investing too much from the get-go. I’m a very busy person, is it easy to set up Vend on iPad? It really depends on how many products you have and how busy you are. Some merchants complete the process within a couple of hours, but if you have thousands of SKUs and not a lot of free time then you may need some assistance. If you need someone to walk you through the process, just get in touch with us and our support staff can assist you. Vend also offers professional services that include hands-free setup (where we take care of everything, including migrating products and customers) and one-to-one training. Contact us for more information. I’m not a techie person, will I have a hard time migrating my products and customers to Vend? We even made a guide to try to make it easy and fun to get started. Check it out here. And if you need someone to guide you throughout the migrating process (or even do it for you) you may want to consider investing in Vend professional services so we can get you up and running in as little time possible. Contact us for more information. I don’t like to get stuck. If I have questions, can I call your support team at any time? But to be sure, swing by Vend's hardware guide as well as our Recommended Hardware Page for detailed specs on the hardware, peripherals, and computers compatible with Vend. I need someone to come over and set up my iPad POS system. Does Vend do “house calls”? Click here to view our expert directory and locate a Vend partner near you. Can’t find one in your area? Vend also offers professional services which are designed to take the pain out of migrating from your current POS system. Contact us for more information. I’m happy with my current POS system. Is Vend really a better option? Most people who switch to Vend never look back. Merchants love the software’s user-friendly and intuitive interface, as well as its features and integrations. You don’t have to take our word for it though; here are some examples of Vend customers and what they have to say about the POS. However, we understand that each business is unique and not all tools may be a good fit for you. That’s why we invite you to take a tour of our software and see if it meets your needs. You can also register for a free account to get a hands-on feel of how it works. Finally, you can always talk to our trusty sales consultants for any specific questions or concerns and they’ll help you decide if Vend really is right for you. Drop us a line at sales@vendhq.com. I like Vend but I don’t know where to start, what should I do next? Try out our iPad POS system for 14 days – it’s free.